Consider a small child sitting on his mother’s lap while she reads him a picture book. The picture book opens to a width that effectively places the child at the center of a closed circle – that of mother’s body, arms, and the picture book… That circle, so private and intimate, is a place apart form the demands and stresses of daily life, a sanctuary in and from which the child can explore the many worlds offered in picture books. Despite all of our society’s technological advances, it still just takes one child, one book, and one reader, to create this unique space, to work this everyday magic. Perhaps there’s nothing more important than raising a family who loves books and reading. Sure children read in school, but the foundation starts at home. Reading at home shouldn’t be an afterthought or a burden, instead it should be a joy to spread the love of reading to last a lifetime. Being in the classroom, I know which students have reading support at home. 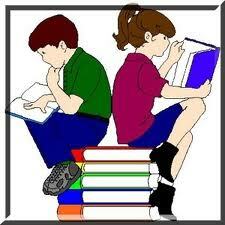 Normally, reading thirty to sixty minutes, depending upon the age, is homework each night. In my opinion, it shouldn’t be homework. Reading at home should be enjoyed so much that you have to tell your child to turn the book light off and go to sleep. Of course, it takes work to raise a family of readers. A Family of Readers is just one book from the many books that promote family reading. It states in the jacket: A Family of Readers is a book for readers, people who need books as much as food or air. The editors are from The Horn Book Magazine, which publishes information about books for children and young adults. The book is divided into four sections: reading to them, reading with them, reading on their own, and leaving them alone. I like this book, because it provides many book examples and brief descriptions for each category. The bibliography provides the books and additional reading resources. 1. Never read where you child can see you. 2. Put a TV or computer in their bedroom. 3. Correct your child every time they mispronounce a word. 4. Schedule activities after school so your child will never be bored. 5. Once your child can read independently, throw out the picture books. They’re for babies. 7. Give little rewards for reading. 9. Buy only 40 watt bulbs for your lamps. 10. Under no circumstances read your child the same book over and over. One time is enough. 11. Never allow your child to listen to books on tape or CD; that’s cheating. 12. Make sure your kids only read books that are “challenging”. Easy books are a complete waste of time. That goes double for comics and MAD magazine. 13. Absolutely, positively no reading in bed. This entry was posted in Book Review, Reading Resources and tagged A Family of Readers: The Book Lover's Guide to Children's and Young Adult Literature, Book Review, bookworm, children reading, family reading, Martha V. Parravano, postaday2011, Roger Sutton, The Horn Book. This week I showed bookworms with books, pictures, and poems. 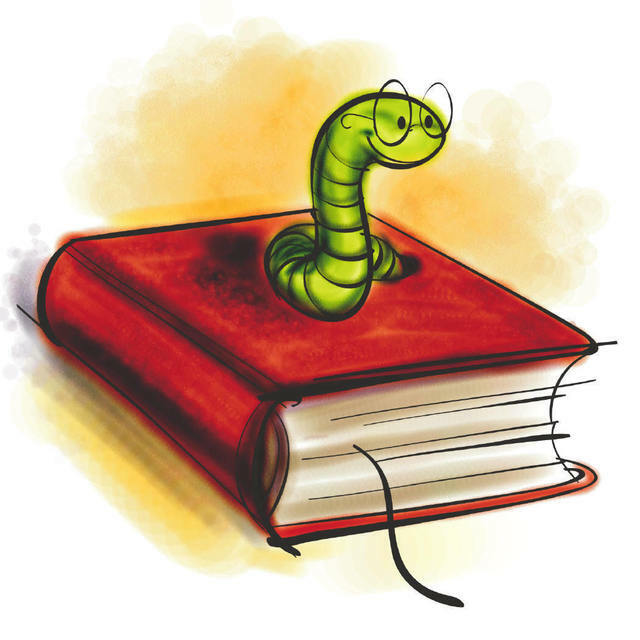 Today I’m going to view a bookworm as most people think – a book lover. How do you know if you’re a bookworm? I made a list of possible bookworm traits. You don’t have to have each trait. Leave comments for additional bookworm characteristics. 1. People often find your nose in a book spending hours at the library or bookstore. 2. Amazon.com is bookmarked and frequently used when you can’t get to the library or bookstore. 3. Who cares about the next DVD release? When can I get the latest book release? 4. Books are on your Christmas or birthday list. 5. You’d rather read a book than watch television. 6. You argue that the books are always better than any movie based off a book. 7. You get a thrill when you open the book for the first time and feel its pages with the promise of a next favorite. 8. You smile when you see children reading rather than playing video games or watching television. 9. You cringe when you see watermarks, torn pages, and vandalism to books. 10. It’s normal to leave the house with some reading material. 12.You listen to more audio books than the car radio. 13. You dish out recommendations and welcome any in return. 14. You constantly add books to your to-read list. 15. You stay up past midnight to finish a great book. 16. After you finished the great book, you wish you slowed down to savor it. 17. You imagine meeting your favorite book characters. 18. You’d like to jump into your favorite book to fully experience it. 19. You don’t have enough shelves to hold all your books. 20. You analyze and discuss books with fellow bookworms. 21. You look forward to school and library book sales. 22. You ‘browse’ books in a bookstore and come back each week. 23. You read The New York Times’ Bestseller List for new books to read. 24. You have a bookstore membership for book rewards. 25. Rainy days are good reading weather days. 26. You enjoy any reading, even what some consider ‘junk mail’. 27. You feel lost without a book to read. 28. You love hearing stories read to you. 29. A long flight, car ride, or train journey is the perfect time to read a book. 31. You remember quotes and passages from your favorite books. 32. You compare individuals to characters in your book. 33. You have an endless supply of bookmarks and battery replacements for book lights. 34. You’re not afraid to laugh or cry while reading. 35. You read the book that made you laugh or cry again. 36. You spread the word to everyone to read a book. 39. You try skills and hobbies as characters in books. 40. You’re sadden when bookstores and libraries close. 41. 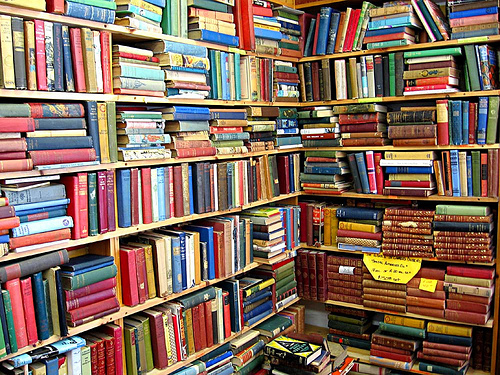 You have difficulties picking just one favorite book. 42. You know that reading will never die, even with more e-readers and technology. 43. You feel bad for those who don’t enjoy a good book. 44. You wish you could talk to the author after finishing a book. 45. You attend book signings and author discussions. 46. You know that reading is your ticket to anywhere your heart desires. This entry was posted in Reading Thoughts and tagged bookworm, bookworm traits, postaday2011, reading, reasons to read. 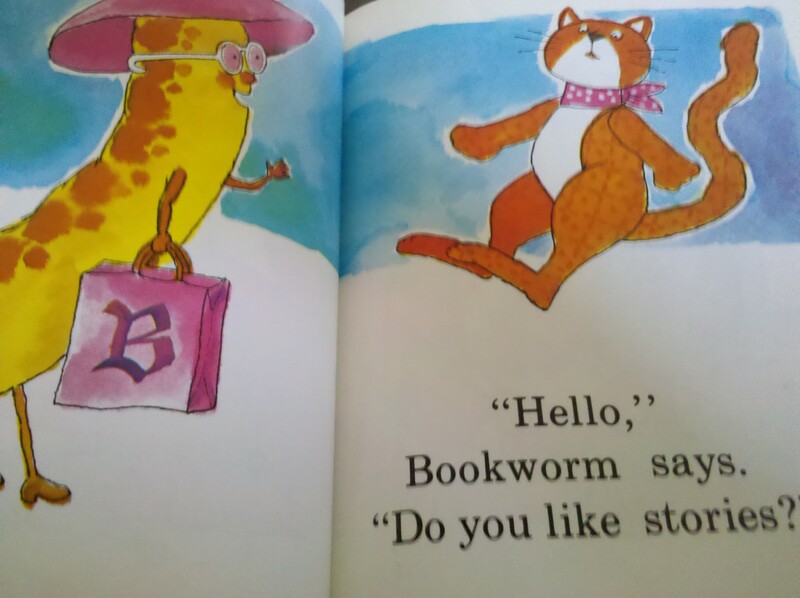 This is the story about Calico Cat who has nothing to do until he meets Bookworm who introduces the wonder of books and the library. 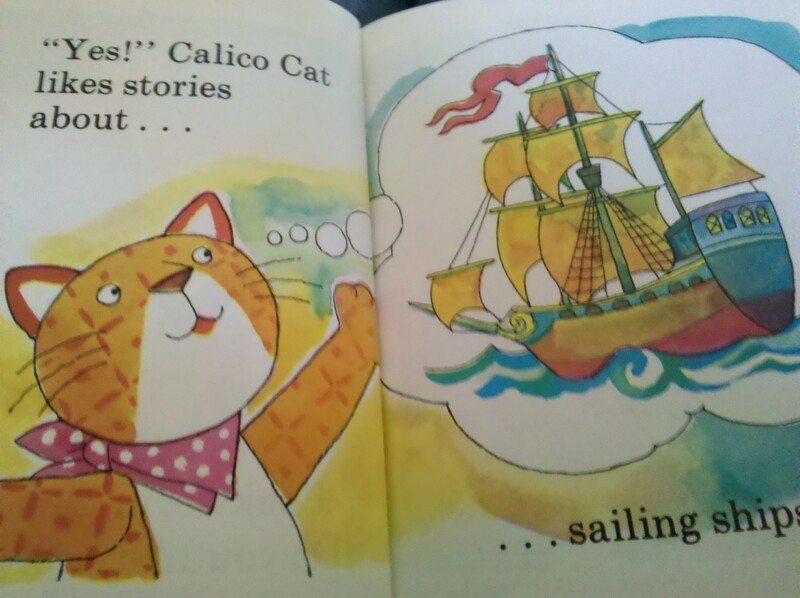 The book explores different stories that Calico Cat enjoys, such as stars, sailing ships, far away lands, clowns, and trains. Bookworm explains all those stories and more can be found at the library. 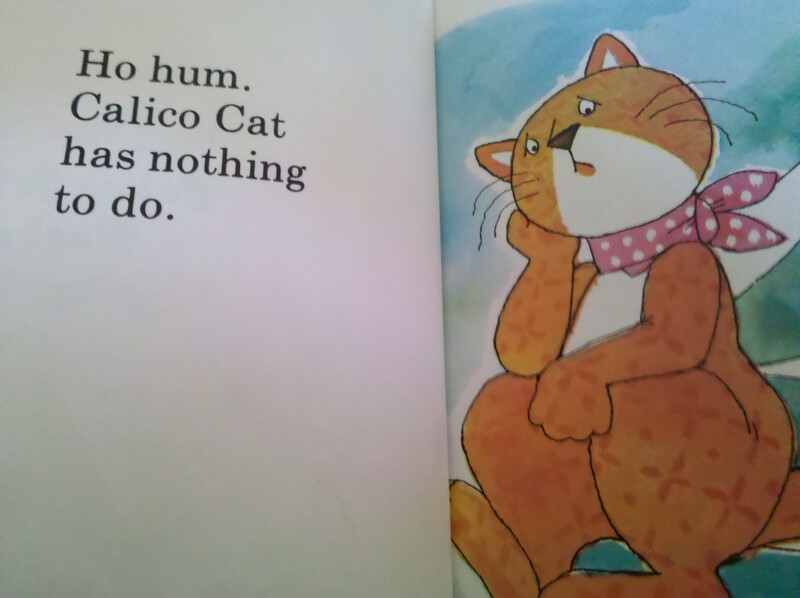 Calico Cat Meets Bookworm was published in 1978, so people may not be aware of this book. My copy from the library was in the main stacks that wasn’t checked out often. I think this is a shame, because it’s a simple book that gets to the heart of books and reading. 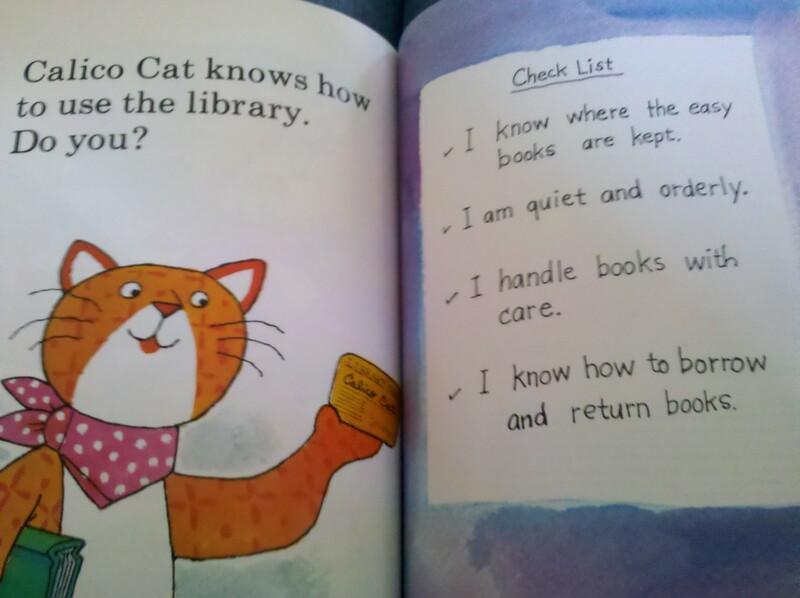 The last page gives a check list how to use the library: I know where the easy books are kept. I am quiet and orderly. I handle books with care. I know how to borrow and return books. You’ll probably have to buy this book through an outside seller, such as on ebay or half priced books. Cross your fingers that your library has the book. This entry was posted in Ages 4-6, Book Review, Children's Book, Library, Picture Book and tagged Book Review, bookworm, Calico Cat Meets Bookworm, children's book, Donald Charles, library, picture book, postaday2011, reading. The Amelia Bedelia book series describes a housekeeper who takes everything too literal and gets herself into mix-ups. In this book, Amelia Bedelia volunteered at the library but not everything went according to plan. She misheard the librarian and thought all the children received a bookmark, but actually the librarian stated: “Here’s your book, Mark.” She helped children with book reports and created bookmarks, but she got herself in trouble when she stole the bookmobile. I thought this was a delightful read and excites children about using the library and reading books. Besides, who doesn’t want to be a bookworm? “What am I going to do now?” said the girl. This entry was posted in Ages 5-7, Book Review, Chapter Book, Children's Book, Library and tagged Amelia Bedelia, Book Review, bookworm, chapter book, children's book, Herman Parish, library, Lynn Sweat, postaday2011. would make me feel much better. because I love to read. Books to us are food for thought. Bookworms nibble what they should not. books to him are thoughts for food. This entry was posted in Quotations and tagged bookworm, poem, poetry, postaday2011, reading. I enjoy looking at the popular search engine terms that lead others to view my blog. The overwhelming search result during the past week related to bookworms. I only wrote one post that relates to a bookworm. So, I thought I’d provide additional books and information about bookworms. 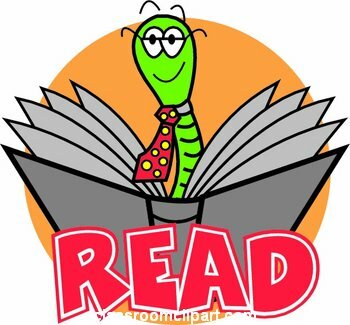 Today, I’m providing fun bookworm pictures and coloring pages to use. I’m also providing scientific information, prevention, and how to remove bookworms. So fellow bookworms, find a delicious book to eat. This entry was posted in Humor and tagged bookworm, bookworm images, bookworm pictures, coloring pages, how to remove bookworms, postaday2011. Do I want to be a bookworm? I thought of the word ‘bookworm’ with affection. 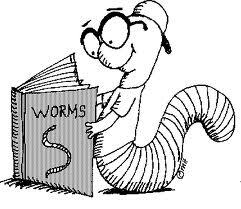 I mean worms aren’t very harmful and tag along the word book and it should be cute. I was curious about the word’s origin. Well, the exact origin wasn’t clear but I thought the results were interesting. Normally, when definitions are given in a dictionary the first entry is most commonly used followed by other definitions. It was the order that I thought was funny. 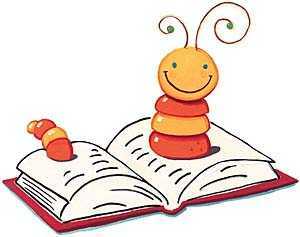 Bookworm is basically used in two definitions: a reader and an insect that feeds off book paste. any of a number of insects or insect larvae that harm books by feeding on the binding, paste, etc. Any of various insects, especially booklice and silverfish, that infest books and feed on the paste in the bindings. I am a bookworm. For play, I bury myself in the corners of libraries and read. This entry was posted in Humor and tagged bookworm, humor, postaday2011, postaweek2011, quotation, Robert Littell.